Bay Art Gallery is pleased to announce the work of artist Cecile Johnson Soliz for our first exhibition this autumn. 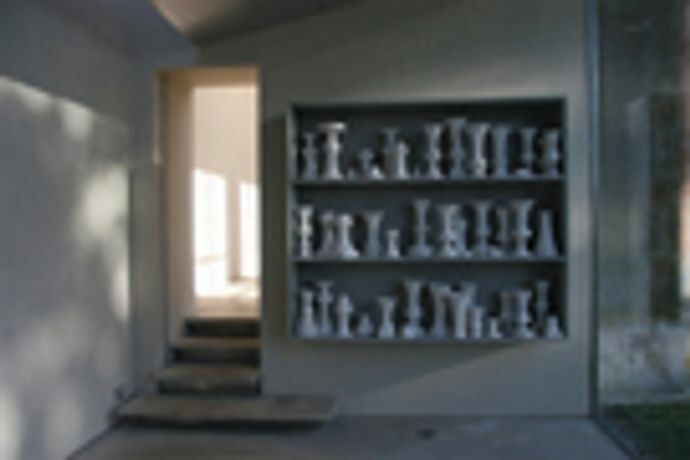 A range of sculpture, watercolours, photographs, and other works from 2004-2011 will be on show from Complex questions are asked about how we know things - whether the weight of a pitcher or the order of things in a market, a street or a shelf. Johnson Soliz asks us to look more closely and find out for ourselves through the process of looking. Her concern with both public and private spaces and how we move through them is articulated in sculptures and photographs, and while being distinct art forms, each in their own right, Johnson Soliz's concerns are clearly identifiable in each. Penelope Curtis writes in, âRestor'd to Life':âSoliz wants to place her work at the margins of the gallery; associated with a place for looking, but with something else beside. It seems aesthetic (and it is), but it is not esoteric. In fact it is surprisingly real. She wants to bring some of our more quotidian pleasures and experiences towards our assessment of her art. But if she adds the very real and everyday to our experience, she also adds something uncanny, for these objects carry their communal histories, so that the noises and movements of the past now provide them with the breath of animation. They are new, and old, oh so old.